You might be a bounty hunter looking for fame and fortune, a peasant looking to feed his starving family. You might be a maiden running away from her arranged marriage, or just somebody who has gotten lost. Anyhow, you've ended up in the Grimwood, a forest with curious animals, forbidden places, powerful objects, and supernatural creatures. 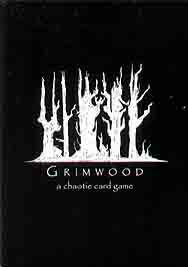 Grimwood is a highly chaotic, slightly strategic game of competition and sabotage. You search the woods, to collect animals, places, and supernatural creatures to score the most points.